This week, we focused on running around corners! 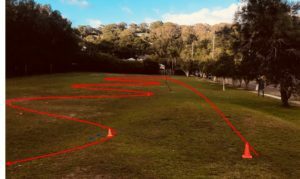 The Avalon School cross country course has turn after turn after turn with only a few short straight sections. So we always run a session to practice getting round the corners quickly and easily. The group learned how to run easy into the corner and hard out – using their arms. The group split up into pairs (or a few threes) for this session. We ran a zig-zag course with seven corners – repeated six times. The run to the top of the field was steady – then fast back through the corners, working on using the arms to drive out. After a break we did another two lap time trial. It’s a really hard session – so some good fitness to be had. And learning how to accelerate out of the corners will be a good skill on school cross country day. The session wasn’t timed and the only competition was with yourself and your running partner. The time trial was for fun and another measure to see how each person is going. Warm-up was hops, hurdles and agility – plus a few cartwheels! Warm-down was skipping. There are more videos from the Australian Commonwealth Games trials this week. These are my favourite feel good moments from the trials – I can’t watch them without smiling. These individuals have trained for years to be the best they can – and then it all comes together on the day. Check out the race video – and then the interviews after. So you’re 17 years old, you’ve dealt with cerebral palsy all your life – and then you set a para world record . . .
You’re 31 years old, you’ve trained most of your life and never made it to a major games – and then you do . . .
Two athletes – two stories. One up-and-coming and the other returning to the sport after a few years break. And then there is the pole vault – just because it is the coolest event in Track and Field . . .